Come join us Saturday, July 23rd, at Memorial High School's Clem Lemire Sports Complex, 1 Crusader Way in Manchester for our annual Fiesta de Musica drum corps show featuring corps from around the country, and Canada, as they perform during their summer tour. This event also features some of the best and most delicious food trucks from the New England area! Once again this year, the Fiesta de Musica drum corps show will feature drumline "battles" where drumline ensembles perform head-to-head in competition. There will be three drumline battles at the show. Tickets are available through Drum Corps International or by calling the DCI Box Office (317) 275-1212.. Box Office opens at 3:00 PM. Tickets will be available at the gate. The Muchachos 7th annual home show, Fiesta de Musica, will take place Saturday, July 19, 2014, 5:30 PM at Memorial High School's Clem Lemire Sports Complex, 1 Crusader Way, Manchester, New Hampshire. Fiesta de Musica is a Drum Corps International (DCI) Open Class competition, featuring Open Class drum and bugle corps with talented performers under the age of 23. Congratulations to 7th Regiment Drum and Bugle Corps of New London, CT on their win at Fiesta de Musica 2013! Before the competition started, the Muchachos performed their field show, "From Fire to Cool," in exhibition before a welcoming audience. All Corps put on great performances despite the hot weather. Congratulations to Spartans Drum and Bugle Corps of Nashua, NH on their win at Fiesta de Musica 2012! It was an extremely hot day and the threat of rain and storms remained into the evening hours. Luckily, only a few drops fell as the show neared the end. Great performances by all the competing Corps. They really stepped it up for the competition. Plus an entertaining performance by Amoskeag Sound Mini Corps to start the show followed by the Muchachos, one of a few all-age exhibition Corps to perform a full field show. All in all, a really great day for Drum Corps! Thank you to all participating corps for making Fiesta de Musica an entertaining success! Our 4th annual home show, Fiesta de Musica, will take place Saturday, July 16, 2011 at Memorial High School's Clem Lemire Sports Complex, 1 Crusader Way, Manchester, New Hampshire, beginning at 5:30 PM. Tickets are $12 for adults and $10 for seniors and children under 12. All tickets purchased online after Sunday, July 10th, will be held at the "will call" station for pick up on the day of the show. 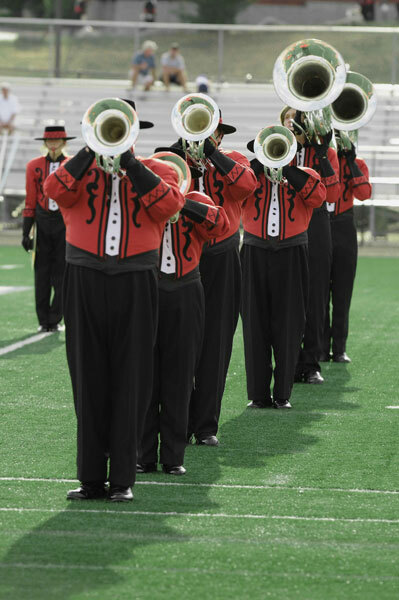 The Muchachos Drum and Bugle Corps is a Drum Corps International (DCI) All-Age Corps that performs in exhibition at DCI Open Class and World Class shows. For more information on DCI, and to view a video about the organization, please visit the DCI web site.